Bill's Movie News and Reviews: "What Would Jesus Buy? ", documentary of tour by "Reverend Billy"
"What Would Jesus Buy? ", documentary of tour by "Reverend Billy"
A neat and somewhat overlooked film recently produced by Morgan Spurlock is “What Would Jesus Buy?” (website) from Palisades Pictures, Warrior Poets, and Arts Alliance America, directed by Rob VanAlkemade. The film starts out with lots of pictures of Christmas-decorated malls and cityscapes, and pretty soon has us on the tour with Bill Talen (Reverend Billy) and his Church of Stop Shopping Choir. The film gives a lot of interesting observations and facts. Christmas is all about “buy now and pay later” urges. 60% of Americans owe more than $13000 in credit card debt. Children average 40 hours of media exposure a week, and up to about age 7 or 8 they do not know the difference between commercials and entertainment. (I used to hate those cereal commercials where words were deliberately misspelled.) There are some homey scenes of kids' toys, and one girl has an interesting model train set. Then the bus tour starts, and even includes a bus accident with a commercial trucker. Pretty soon Billy visits the Mall of America in Bloomington, MN (ten miles south of Minneapolis), which I visited many times when I lived there from 1997-2003. I used to park on the west garage (the western states), and I remember that the General Cinema theaters were to the South. I remember the amusement park, the indoor roller coaster, and even the Pride Alive parties. I particularly remember the Discovery Channel store. They head down I-35, detouring out of Des Moines to visit the small town of Traer, eventually to wind up in Dallas, then head to Las Vegas and Los Angeles to make protests. The end of the film covers the Wal-Mart issue (with a confrontation in Bentonville, AK, corporate headquarters), and the whole subject of “globalization” and mentions workers in Bangladesh who, at age 13, work 19.5 hour days sometimes at 7 cents an hour. The organization “Responsible Shopper” is presented. Andrew Young comments on the Wal-Mart issue, which is said to drive small shops out of business as well as exploit overseas labor. Reverend Billy starts throwing around the term "shopapocalypse". The DVD has some extras, such as a brief short showing a "Ten Commandments" icon being manufactured in China, which the film says does not recognize freedom of religion. This might be a good place to mention the 60 minute documentary “Married at the Mall" (2002, Frozen Feet Films, 60 min. ), produced and directed by Melody Gilbert, and used in discussion in a class in documentary filmmaking presented by IFPMSP in 2002 in Minneapolis. The film portrayed couples getting married in a chapel at the Mall of America, and how commerce and the institution of marriage relate culturally. 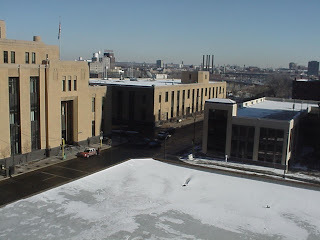 Picture: Downtown Minneapolis MN, Post Office on First Street.